Every year since 2006, the MOLODIST INTERNATIONAL FILM FESTIVAL in Kyiv organises the Long Night of Short Films - Germany, a showcase of up to 30 contemporary short film productions from Germany of all genres. The programme is compiled in cooperation with German Films and the festival team in Kyiv. AG Kurzfilm is in charge of the organisational aspects such as license agreements, communication with film makers, supplying materials for the catalogue etc. The Long Night of Short Films - Germany is now firmly established as a consistent part of the festival programme. The late-night well-attended screening takes about 5 hours and meets an outstanding response especially amongst the younger audience. In addition to the programme, German Films invites German filmmakers to present their films to the audience on hand and visit the festival. 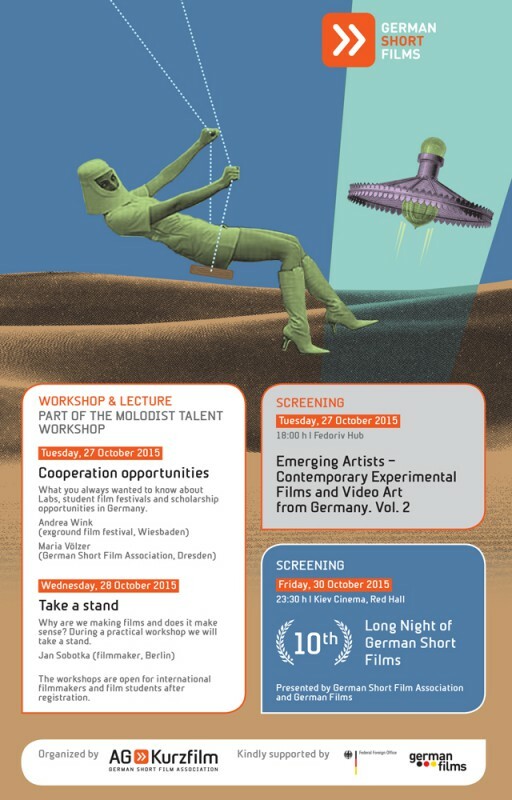 In its tenth year, the programme LONG NIGHT OF SHORT FILMS - GERMANY 2015 at the 45th MOLODIST INTERNATIONAL FILM FESTIVAL will be composed of a selection of especially memorable films chosen from the programmes 2006 to 2014 as well as of a choice of some as the latest productions from Germany. For the annual programme of the LONG NIGHT OF SHORT FILMS - GERMANY from 2006 on please see our German website. In 2014, the cooperation could be extended by workshops offered by AG Kurzfilm in the context of the Molodist Talent Workshop 2014. German and Ukrainian filmmakers exchanged their experience regarding festival participation and alternative financing strategies for film projects. The workshops aimed at bringing German and Ukrainian participants into contact but also reinforcing the network of local film professionals. The workshop programme was continued in 2015 and takes place athird time in 2016. The MOLODIST INTERNATIONAL FILM FESTIVAL in Kyiv is the oldest film festival in Ukraine and one of the most renowned film industry meetings in Eastern Europe. It focuses particulary on the films – shorts as well as features – of young directors.